UPDATES. This post is updated with additional information. 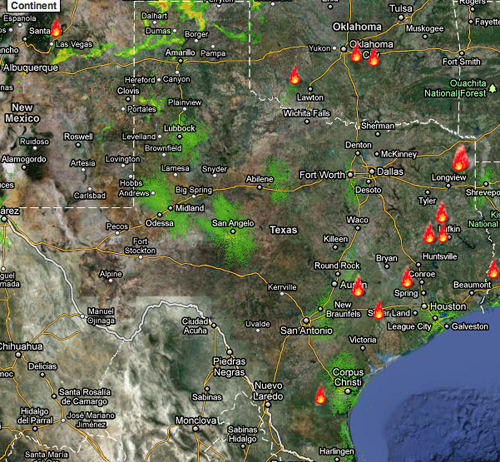 More than 1,000 homes have burned near Bastrop in one of the most destructive and largest fires in Texas history. 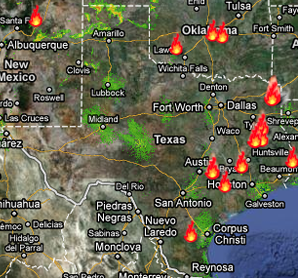 Over 180 fires have erupted across our state in the past week alone. Citizen Patriot Response requests Tea Party, 9-12, and other liberty-minded individuals and groups to organize efforts to assist the roughly 1,200 firefighters working on the frontlines of this historical outbreak of Texas wildfires. Citizen Patriot Response is preparing to begin delivering cold bottles of water to firefighters in the Bastrop area in an effort to do our part. Many other organizations and individuals in Texas are doing the same. We need support, we need more efforts initiated across the state, and we need communication and collaboration between group leaders to ensure that men and women fighting the Texas wildfires have full support. For example, Mike Flynn at Andrew Breitbart's biggovernment.com is helping by spreading word of the call to action. It's so inspiring to see people use their energies to help support our public servants who are defending our state and Texans' homes. The Citizen Patriot Response headquarters and shelter is located in Hays county and now has limited space available for Texans left homeless by the wildfires. Please share this important information with others!